Secrets on great Carnival savings by the Tenerife capital. Tenerife Carnival 2009 used of 120 unemployed Chicharreros (inhabitants of Santa Cruz) besides the usual members of groups of the mad season. All were trained and supervised to help with preparations late in 2008.
to save on Carnival costs. Look at the outfit above, previously, worn by a mourner in a very simple black carnival costume. This widower outfit of sorrow was for the Burying of the Sardine, a symbol of Tenerife Carnival liberty. Complement your costume with black lace stockings like the guy in the image. Paint an outrageous, disturbing, temporary Tattoo onto your body. You will look like coming out of the Rocky Horror Movie Show. Obviously, this Carnival outfit in the photo was very cheap, although it has great style. 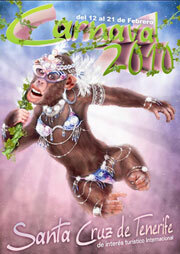 Why disguise motto 2009 may be a saving for Carnival madness in Santa Cruz de Tenerife? combined with cheap dark clothes. for the theme of classic horror movies. Much can be achieved with accessories like hats, masks, scarves, easy to make capes and black lace. Find horror inspirations by the Movie Lord of he Rings! All tips may help you for horror Carnival disguise in any place or country. Carnival queens. Every year a grown up lady as well as a young girl are elected as queens in different galas. By the way, the Tenerife town Los Realejos selected recycling as their Carnival motto 2009. What a good alternative to economize with carnival costumes! However, it's to be expected that other Tenerife towns will follow the capital's example. 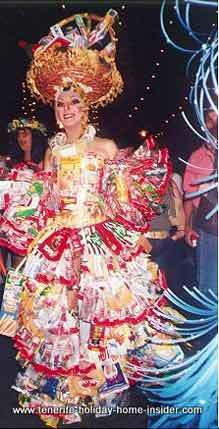 The strikingly beautiful Puerto de la Cruz carnival dress beside was made of recycled plastic of countless shopping bags and cartons, many years ago. From Tenerife Carnival to hotels Tenerife for Carnival holidays. Yours is an amazing choice by 30 different sites, all at once..
By the way, the Tenerife carnival 2010 motto became 'evolution of mankind'. Ironically, this latest poster seems to refer to the 'primate' Darwin theory. Young man Waldemar Lemanczyk Paz from Arico created by means of 3D and other IT design tricks the evolution of the ape to carnival monkey. Ha! Waldemar's Tenerife art was one of 50 works which competed. Eaton and many more celebrities of the roaring twenties towards the end of Tenerife Carnival, provided you have an antique car which can take part.